A Fahrenheit 451 for kids, The Property of the Rebel Librarian is a must-read for anyone who loves books, libraries, and the freedom to choose what you will read. June Harper is a rule-follower until the rules don't make sense anymore. Her very strict parents get upset about a book she is reading that they decide is "too scary" for her. June doesn't agree. 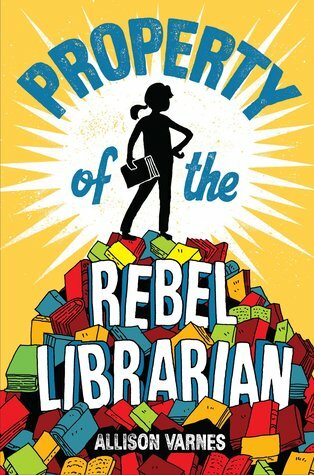 As active members of the PTSA, her parents get the librarian who recommended the book suspended from her job. They also confiscate "objectionable" books in the school's library as well as June's personal stash. Objections include anything that might inspire children to rebel as well as Captain Underpants because the word "underpants" is in the title. June knows what they are doing is wrong, but doesn't know what to do about it. That is, until she comes across A Little Free Library and borrows a book from it. As someone who loves libraries for the autonomy they promote and the expansion of knowledge about the world and people both similar and different from yourself, I cannot promote this book enough. I also loved how significant the contribution of the Little Free Library was as someone who has one on her front porch. The thought of being able to find a way to liberate a community within a repressive majority was inspiring. June wasn't rebelling for the sake of rebelling. She was rebelling because she was right. And while her actions were very divisive, many people rallied behind her cause. I was ugly-crying by the end of it.